Or at least that’s what a friend told me after he encouraged me to eat a piece of baklava for him when I mentioned I was on my way to the annual Raleigh Greek Festival. Whether or not it’s true, I did happily consume quite a few calories at the 30th annual festival hosted by the Holy Trinity Greek Orthodox Church in Raleigh. It brought back some very fond memories of the Winston-Salem Greek Festival that I had attended almost every year, but hadn’t been able to make since starting college and I’ve really missed the experience. I only learned about the Raleigh festival on Friday night and was able to quickly recruit a couple of friends to go with me the next night. Once there, we skipped the more expensive (what do you expect from three poor recent graduates?) 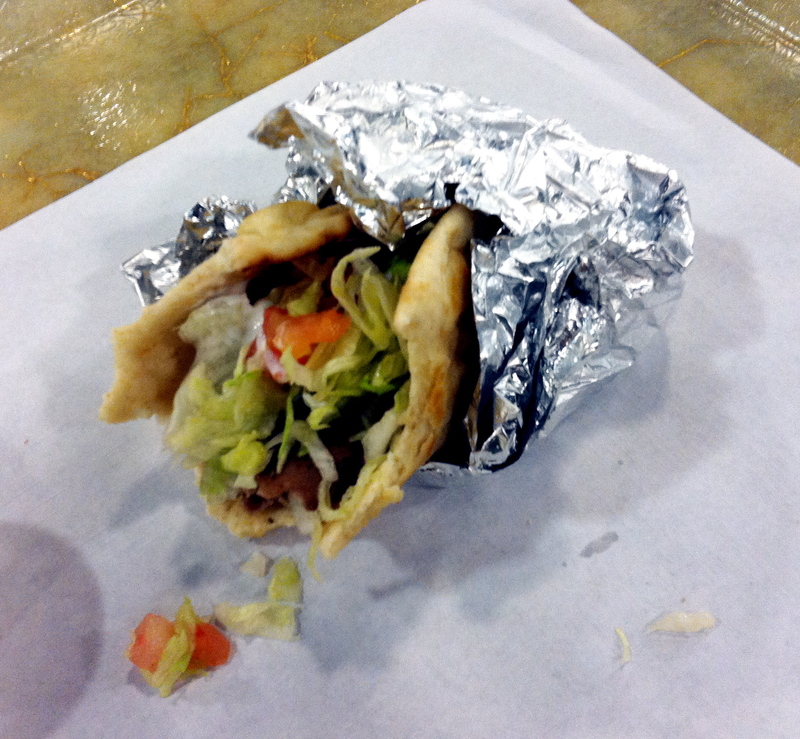 though delicious looking dinner options and instead chowed down on the hamburger of Greece, the gyro. I don’t typically enjoy lamb, but the seasoned meat in gyros is simply deletable, and I can never get enough of it and Holy Trinity’s did not disappoint. My delicious dinner minus a few bites. After we finished the main course, we had to choice from the vast selection of Greek pastries, most with unpronounceable names such as Loukoumades or Karithopita, and we ended up sharing a bowl of the slightly non-traditional baklava sundae. 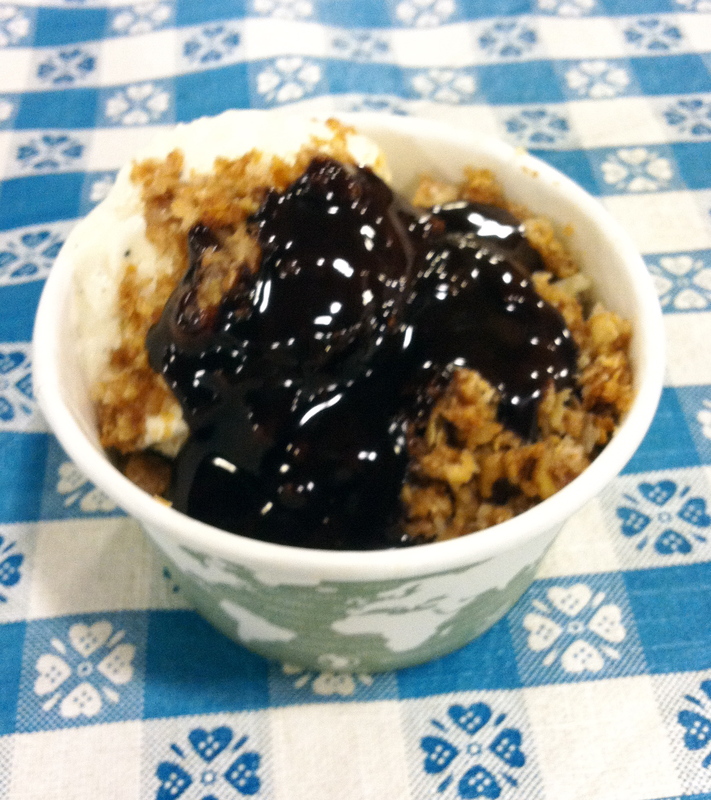 The treat consisted of superb vanilla ice cream sprinkled with bits of baklava and topped with chocolate syrup. After we had stuffed ourselves silly, we went for a stroll around the booths selling a variety of “Greek” wares ranging from carved Nativities to Russian nesting dolls to beautiful icons. 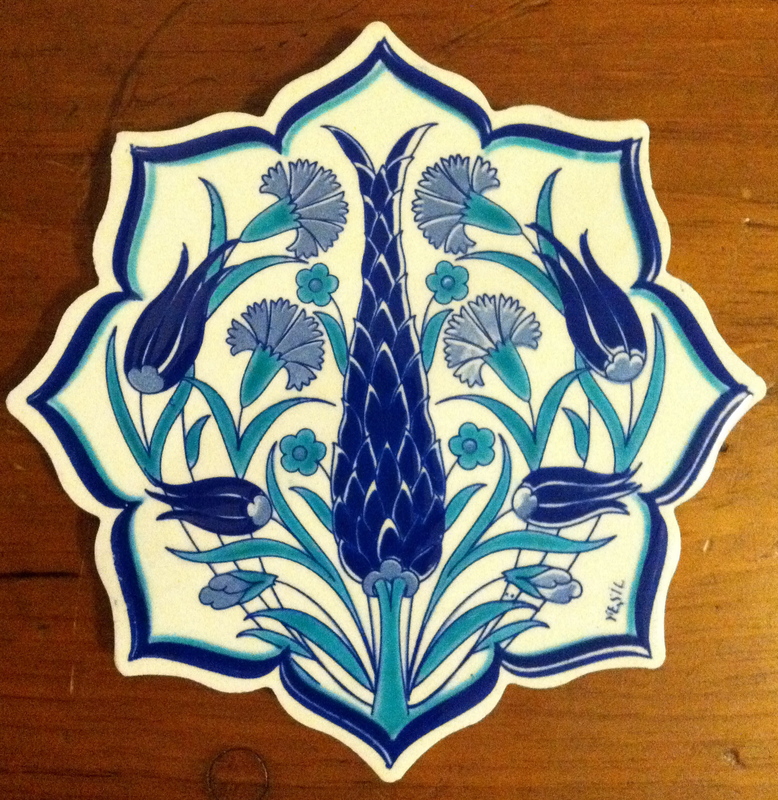 I fell in love with a beautifully hand painted ceramic tile and I quickly bought it to bring some more color into my kitchen and use a trivet. So it was a great experience with great friends and great food. Can’t wait till next year! Focus on the Fish Balls!